I love listening to audio podcasts on my daily commute to school and on car trips. I frequently subject my family members to different podcasts (like Science Friday or NPR’s Technology Podcast) when we’re shuttling kids to lessons or other meetings after school. I’m currently subscribed to 65 podcasts on my iPhone with Pocket Casts. Podcasts can be excellent examples of “long tail” media. Unlike mainstream media productions which need to have relatively broad appeal, podcasts can and often address “niche interests.” I love this dynamic, and how there are not any specific time limits to how long or short an audio podcast must be. I currently publish professional podcasts on two channels (“Moving at the Speed of Creativity Podcast” and “Fuel for Educational Change Agents“) but also periodically on Spreaker and SoundCloud. My professional and personal learning is transformatively enhanced every week by podcasts to which I listen. I cannot understate the importance of audio podcasts for my ongoing learning as a professional educator. I also love Apple and iOS devices, but I enjoy subscribing to podcasts with apps and software programs which are created by third-party developers. I’ve used Apple podcatcher software over the years, but for different reasons I’ve found third party apps better fit my needs and workflow. One example is the support Pocket Casts provides for creating and sharing podcast episode links, and links to specific timestamp locations in podcasts. It has been challenging to subscribe to some podcasts at times, however, which are only listed on the iTunes Podcast Directory. The RSS / “subscribe” link to many Apple iTunes podcasts isn’t directly provided in the webpage preview of the podcast, however, and not every podcast website provides those links either. On a laptop or desktop computer with iTunes software installed, click the SUBSCRIBE link for the podcast you’re interested in. In iTunes, click the PODCASTS link in the left sidebar. (If you don’t have the left sidebar visible, choose VIEW – SHOW SIDEBAR from the top menu. 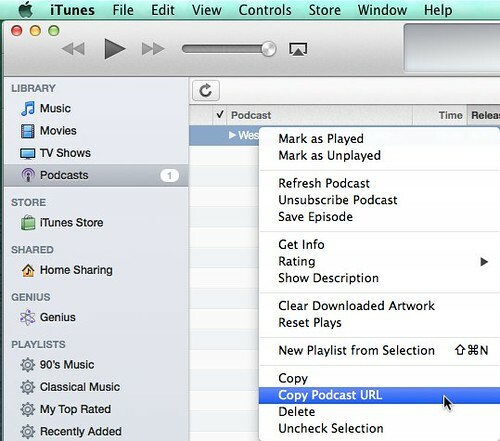 Paste the link into your favorite podcatcher app or software program.